My tablet is not a Tab 3 lite but a full Tab 3. When I click on update it says that I have the latest version but surely I should have 4.4.2? When it is finished if it gives you the pass it will reboot and take a while to upgrade. Thanks. I seem to need PDA 5210xxUANB3. Not sure that I understand about loading it into AP/PDA slot. Is this just a matter of following instructions. Yes. If that is your correct model number, you should be able to download the firmware, Odin, and Samsung Universal USB Drivers. In Odin, your device will show up with a blue block that says com and some numbers. Depending on which version of Odin you use the correct slot will be AP...if you use an older version of Odin the slot is PDA. Just load the firmware into that slot and hit start. 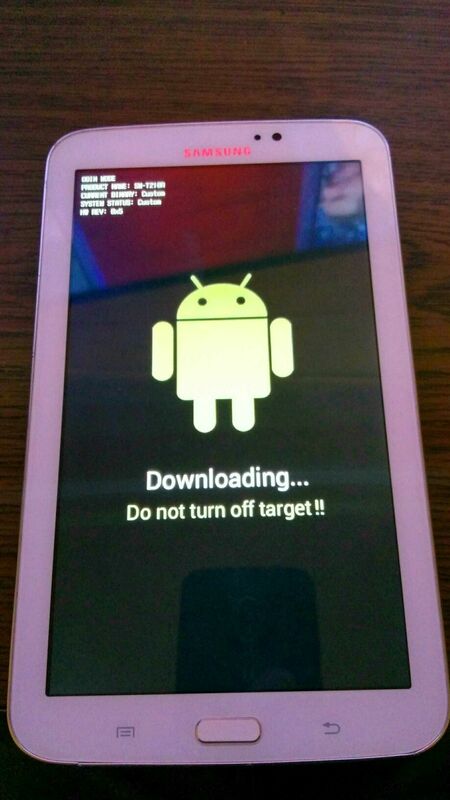 It'll take a little bit, as it updates the bootloader as well as the firmware. Once it's done it should reboot automatically, the first boot with the new firmware could take up to 15 mins. So I need to download Odin before I do anything else. Yes and Samsung Universal USB drivers. I got the surprise of the year, when I turned on my Tab 3, just out of boredom, and see an update notice. I was thrilled, to see it, and it updated smoothly to 4.4, which means I can now use a Kodi fork on it, and have yet another device to access the streaming world. My Tab 3 was my first little Android tablet, that I got for free from Sprint, quite a few years ago. I had given up on it, and bought the 7" Amazon basic fire tablet on a black friday last year for $39 and have been using that for a few things, but now compared to the Tab 3, it is slow as molasses, and I have switched it out for my trusty old Tab 3, It was like a xmas miracle. It is running great, yay! Help samsung s7 edge flash rom has 5 files what to use?